The FSU Libraries and the Center for Humanities and Society invite you to join us for a cross-disciplinary dialogue on how we understand and represent spaces around us with different forms of sensory input and output. Speakers will address ways that we approach, make sense of, and articulate sensory experience as psychological, cognitive, and socio-historical constructions drawing on neurobiological, emotional, and socio-cultural interpretation. Through such practice, we define boundaries between mind and body, self and society, and idea and object in specific cultural and temporal contexts. 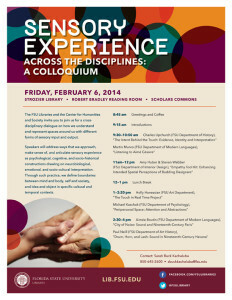 The Scholars Commons Spring 2015 Colloquium will be an interdisciplinary focus on the Senses. FSU faculty from across campus will have a cross-disciplinary dialogue on how we understand sensory perceptions. FSU Art Professor Holly Hanessian will be speaking on her Touch in Real Time Project along with several others, who are presenting on their research as well.